Constructed of premium aluminum alloy with refined polishing, the iPhone docking station perfectly finished for a solid build, highlights edge and smooth surface. This stand holder is specially designed to charge Apple watch, airpods, iPhone, and hang your headphone at the same time in one place. keep your table clean and neat, because all wire channels are well concealed at the bottom. 1.All Cables are NOT included. 2.The apple stand fits Original lightning cable. 3.The Apple Watch Magnetic Charger not included. 4. Apple watch, iPhone and headphone in picture are not included, just a props. 5.IPhone charging holder can charge your phone with case thickness within 4.5mm. 6.24-Month Warranty for Quality-Related Issues. 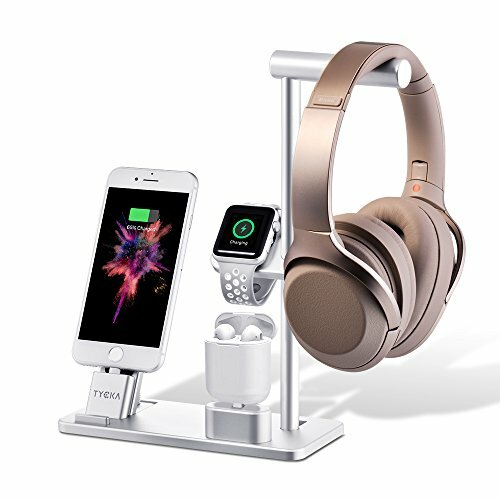 Multi-functional Stand: This stand holder is specially designed to charge Apple watch, airpods, iPhone, and hang your headphone at the same time in one place, it can decorates your office desk, bedroom, study hall and whole home well, Additional headphones holder can place your headphones, in-ear earbuds, as well as your bracelets and necklaces,save more space for you. Washable Nano Stickers: A reusable nano stickers on the bottom. If you want to change the stand to another place, no trace left on the desktop after removal, and the nano stickers is still new after washing, then put the bracket to the place where you want, it is still very stable. Cable Arrange: This stand holder can keep your table clean and neat cause all wire channels are well concealed at the bottom. And arrange your wires neatly，no more tangling cables to bother you. Stable and Durable: Constructed of premium aluminum alloy with refined polishing, the iPhone docking station perfectly finished for a solid build, highlights edge and smooth surface. The anti-scratch rubber and the TPU back protect your Apple Watch and iPhone from away scratching. If you have any questions about this product by TYCKA, contact us by completing and submitting the form below. If you are looking for a specif part number, please include it with your message.